Did you read Part 1 of our Newbury St adventure? Ok then, time for part 2. Fellow ice cream fan Nick brought up ice cream for breakfast last week when Junk Food Guy pointed out a most excellent sounding test batch that just arrived at Ben & Jerry's Boston (174 Newbury St). Sure my wife and I have our SWEET cupcakes in hand, but those can wait until we get home, it's time for ice cream! 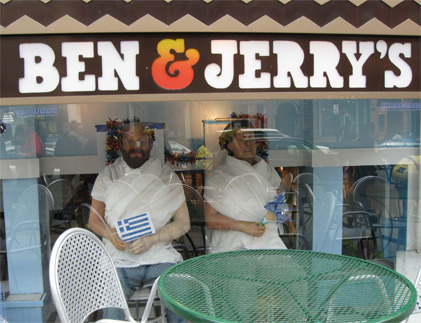 Not the best shot, but you get the idea that Ben & Jerry have gone Greek with their printed flags, laurel head wreaths, and what I can only assume are the hippie version of curtains togas. There's also stickers on the windows describing the new greek froyo flavors. Remember how I mentioned that you have to either go up or down to get to Newbury Street stores? Well, Ben & Jerry's Boston is actually a lower level location which I'm thinking is pretty cool (literally and figuratively) in the summer. It's not a huge place like you might expect. There's just a few small tables inside and a big old counter that's hiding all the tasty ice cream. Lucky for us, there's no one in line, so we get 100% of the attention of the nice fellow behind the counter. I ask him if he still has the test ice cream flavor from the Friday tweet and sure enough he goes and gets us each a sample. My wife likes it but doesn't want a whole bowl of it. Me? Oh yeah, I'm going in! Was it good? Yeah, I liked it alot. It was just a nice, soft, creamy experience. I don't know if I would call it "crunchy" per say because I think that sets expectations a little too high. There is definitely a texture to it, and it does have a good cinnamon morning cereal feel to it. My wife said it reminds her of cinnamon toast crunch. Me? I get a little bit of a maple cream of wheat vibe since the swirl is so thick and hearty in spots. You can tell what they are going for and there is grit to the swirl, I just wish their was more grit. Now keep in mind I adore cereal, maybe not as much as some of my blogging cohorts, but I'm up there. So for me, they could jack the swirl percentage up a bit more, make it a bit crunchier (or add some cinnamon bun dough to the base), and then I would be ecstatic about this one. It's a good flavor, I definitely recommend trying it, I would just love to tweak it a bit. It's that good kind of flavor that makes you want more of the good stuff. As always, I had about several stories to go along with these posts, like reminiscing about shopping at Newbury Comics (a local CD chain) or complaining about how I should have spent more time here during college. 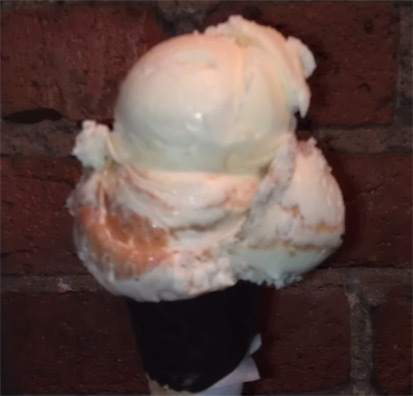 Oh well, it was a crazy weekend and I really do want to get the news out about this spiffy ice cream. I need to keep a closer eye on that twitter feed so I know when the next limited batch shows up. hehehe, sorry man. This one would make a great breakfast. 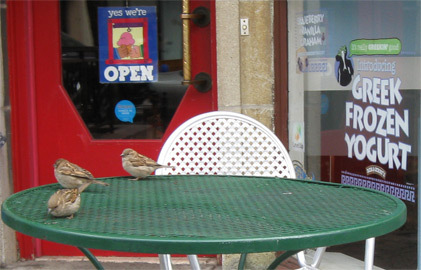 It's unfortunate you couldn't visit J.P. Licks. There are still many Boston locations, but it was easily the best stuff on New bury STreet before it closed last month. wow, that's just disappointing. I've been meaning to visit their new Wellesley location, but it's sad to think their is less ice cream on Newbury now.